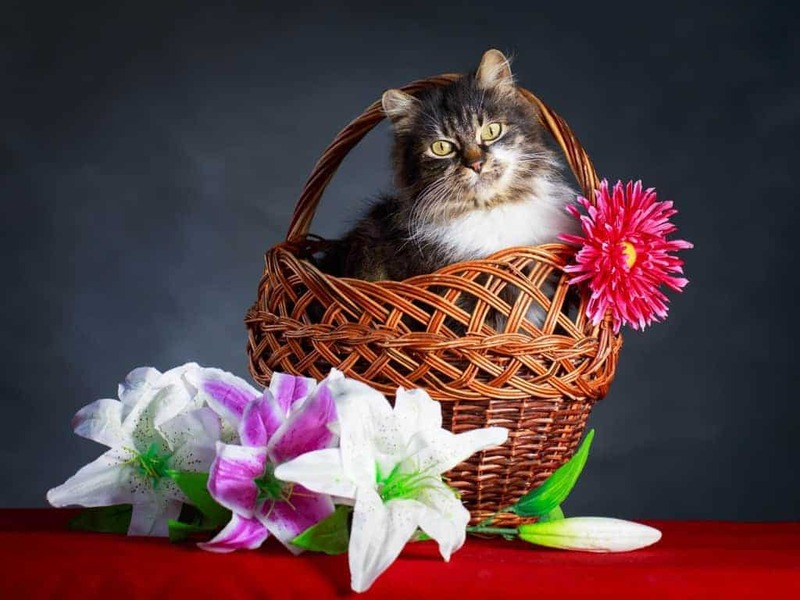 Amy Shojai Blog >> Emergency Help >> Cats & Easter Lilies Danger, A Deadly Combo! I write about Easter lilies danger nearly every year to warn pet lovers and especially those with cats. The gorgeous lily makes its appearance each Easter, decorating church, home, and garden. I can’t have them in my house, though. I won’t to risk having an Easter lily anywhere near my cats Seren and Karma or for Magical-Dog. For cats especially, the fragrant blooms can mean death. Don’t get me wrong, I love lilies. They’re gorgeous. And I love flowers–our house is surrounded by about 500 rose bushes getting ready to bloom this spring. But my Seren-kitty used to munch any plant I bring into the house and Karma will play with anything. Many lilies are lethal to cats. Easter lilies, stargazer lilies, and Asiatic lilies are the most dangerous, and different cats react in various ways. The plants contain a chemical that can damage the kidneys, and kill your cat. Dogs often gnaw leaves, dig up the plant, or eat the whole thing. Felines more often paw-pat and shred leaves and stems during play, and may be poisoned when they later lick and clean their paws and claws. Just biting a leaf or petal can be enough to cause serious kidney disease. Hopefully that picture, above, used fake blooms to stage the image–YIKES! CATS CAN BE POISONED BY DRINKING THE WATER FROM THE VASE! 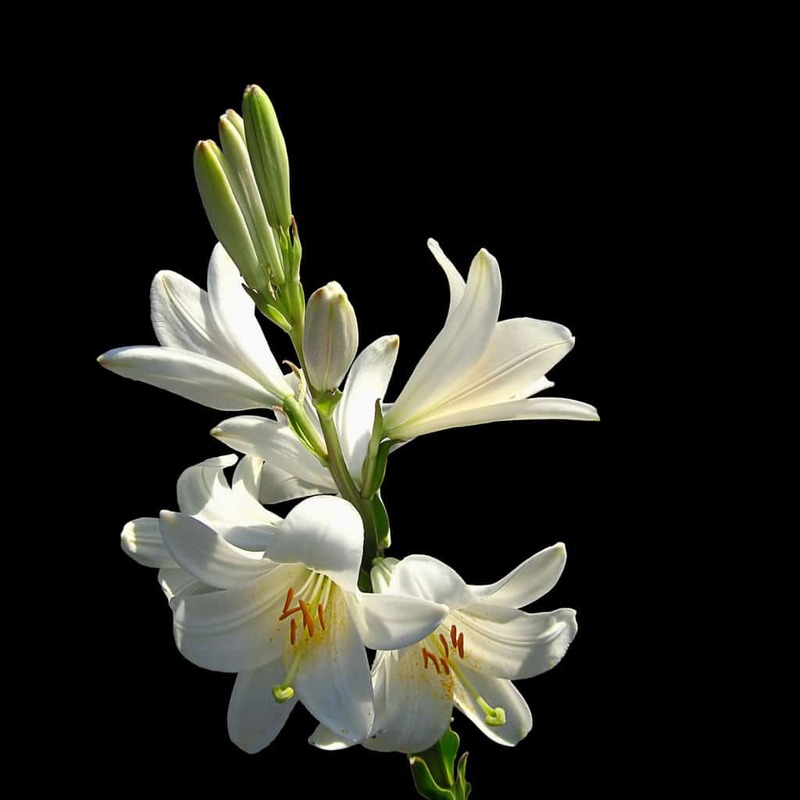 Cats poisoned by Easter lily toxin typically suffer kidney failure within 36 to 72 hours. Symptoms include vomiting, lethargy or loss of appetite. Some cats suffer permanent kidney damage and lose their lives, while others can recover if treated in time with dialysis that gives the organs enough time to heal. Roses can injure cats if they bite thorns, but aren’t toxic and actually are edible…according to Seren! The easiest way to protect your cats is to keep toxic plants out of reach—or out of your house altogether. Besides lilies, other potential harmful plants include rhododendron, sago palm, kalanchoe and schefflera. Azalea can cause vomiting, diarrhea, seizures, coma and death. Eating or chewing caladium, dieffenbachia or philodendron makes the tongue and throat swell up so breathing is difficult. Mother-in-law’s tongue (snake plant) causes everything from mouth irritation to collapse. Crown of thorns and English ivy will prompt thirst, vomiting and diarrhea, stomach pain, and death in one to two days. Holly also causes stomach pain, vomiting and diarrhea. You can keep your pet family members safe and sound by choosing only pet-friendly safe varieties for your garden and home. Calla lilies and peace lilies, which don’t belong to the Lilium genus, are harmless to cats. Calla lily is safe for cats. Peace lily is NOT toxic to cats. There are many other plants that prompt mild problems, such as excess salivation or mouth discomfort. Keeping these out of reach of curious paws may be sufficient to protect your animals. But pet lovers should steer clear of the worst plant offenders, both inside and out. If you see your pet with one or more of these signs, particularly if a suspect plant is within reach, get help immediately! First aid can save the cat or dog’s life. Then take the pet to see the veterinarian as quickly as possible. Different poisons require very specific first aid. Usually that will be either 1) induce vomiting, (cats do this on their own very well–but never when you want them to!) or 2) give milk or water to wash out the mouth and dilute the poison. Making the pet vomit the wrong poisonous plant, though, could make a serious situation even more deadly, so you MUST know what to do for each type of plant. Detailed advice for dealing with the most common plant poisoning is available in the book The First-Aid Companion for Dogs and Cats. The ASPCA Animal Poison-Control Center is available for telephone consultations (1-888-426-4435) in case of poisoning emergency. What cat-safe plants do you have in your home? How do you keep the cat from destroying/eating them? Have you ever had a kitty-plant encounter of the dangerous kind? I knew that Easter lilies were bad for cats, but it wasn’t until recently that I learned that all lilies are and how detrimental they are. As always, so much valuable information. Thank you! Hey Frank, glad you visited the blog! Pingback: Adopting An Easter Bunny? Make Mine Chocolate!